Turkey fires rounds into Syria after unknown attackers fire mortars into Turkish border town. October 3, 2012 - After over a year of harboring foreign terrorists and supporting their operations near and across the Turkish-Syrian border, NATO-member Turkey has claimed it has retaliated with military force against "targets" inside Syria for an alleged attack on Turkish territory that it has blamed on the Syrian government. Despite heavily armed listed-terrorist organizations operating in large numbers on both sides of the Turkish border with Turkey's explicit approval and logistical support, the government in Ankara appears to have excluded the possibility that these terrorist forces, not the Syrian military, were responsible for the attack which consisted of mortar rounds the armed militants are known to widely use. 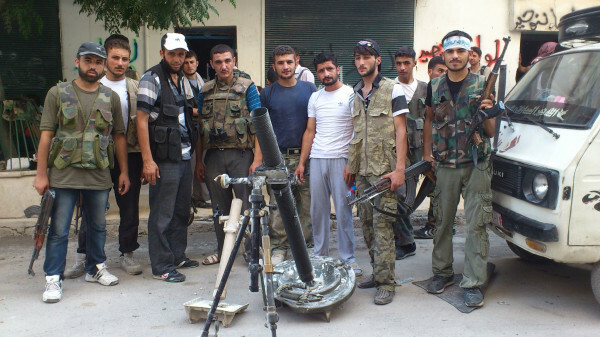 Image: Terrorists operating in Syria pose next to a large mortar. Mortars of all sizes are a favorite of terrorists operating in and around Syria in NATO's proxy bid to effect violent regime change. The mortars fired into Turkish territory could just as likely have come from terrorists Turkey itself is funding, arming, and harboring on behalf of long-planned NATO machinations. Unlike the Syrian government, the terrorists, Turkey, and by consequence, NATO, all have an actual motivation for launching the initial attack that has caused Turkey to retaliate and predictably call on NATO to intervene. It was unknown whether the mortar shells were fired by Syrian government forces or rebels fighting to topple the government of President Bashar al-Assad. The Turkish response seemed to assume that the Syrian government was responsible. Turkey's immediate, unwarranted act of military aggression, along with knee-jerk condemnations from the US bear all the hallmarks of an orchestrated event - or at the very least an attempt to opportunistically seize upon an isolated incident to disingenuously advance the West's collective geopolitical agenda. Syria clearly has no interest in threatening the security of Turkey, nor any reason to attack Turkish territory which would surely give NATO the excuse it has been looking for to directly intervene on behalf of its faltering terrorist proxies. It was previously reported that Turkey was intended by NATO, and more specifically, Wall Street and London, to lead efforts in carving out "safe havens" in Syria's north, and to do so either under a false "humanitarian" or false "security" pretext. Turkish leaders have clearly spent much time fabricating various excuses to meet Washington's demands in this regard by fabricating or taking advantage of violence Turkey itself is fostering along its own border with Syria. Because creating a unified national opposition is a long-term project that will probably never fully succeed, the contact group, while not abandoning this effort, may seek more realistic goals. For example, it might concentrate maximum effort on breaking Asad’s hold on, say, the elite of Aleppo, which is the commercial capital and which is also the city where Turkey has the greatest leverage. If Aleppo were to fall to the opposition, the demoralizing effect on the regime would be considerable. Should this option fail, the United States can simply accept a bad situation in Syria or escalate to one of the military options below. -page 6, Assessing Options for Regime Change, Brookings Institution. it, keeping a regional adversary weak, while avoiding the costs of direct intervention," to Libyan-style "no-fly zones," to a full military invasion. It is clear, upon reading the Brookings memo, that the conspiracy has indeed begun to unfold since its writing - with various military options being prepared and various co-conspirators positioning themselves to execute them. The Brookings Institution's "safe havens" and "humanitarian corridors" are meant to be established by NATO-member Turkey, who has been threatening to partially invade Syria for months in order to accomplish this. And while Turkey claims this is based on "humanitarian concerns," examining Turkey's abysmal human rights record in addition to its own ongoing genocidal campaign against the Kurdish people both within and beyond its borders, it is clear they are simply fulfilling the agenda established by their Western patrons on Wall Street and in the city of London. 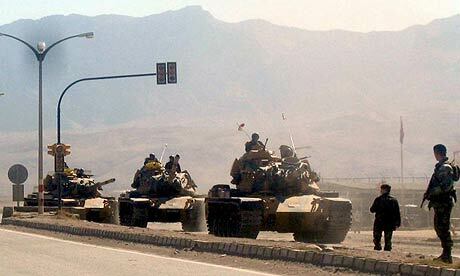 Photo: Turkish tanks entering Iraq to raid Kurdish towns and hunt suspected rebels in 2008. More recently, Turkey has been bombing "suspected" rebel bases in both Turkey and Iraq, as well as conducting mass nationwide arrests. Strangely, as Turkey verifiably does what Libya's Qaddafi and Syria's Assad have been accused of doing, in all of their hypocrisy, have been calling for a partial invasion of Syria based on "humanitarian concerns." This latest exchange between Turkey and Syria is not the first. Turkey has fabricated stories before involving Syrian troops "firing across" the Turkish-Syrian border. The New York Times published these bold accusations before admitting further down that "it was unclear what kind of weapons caused the injuries on Sunday around six miles inside Turkish territory," and that "there were conflicting accounts about the incident." As are all the accusations used by NATO, the UN, and individual member states to justify meddling in Syria's affairs, these tales involve hear-say from the rebels themselves. It is clear that Turkey, NATO, and the UN are continuously attempting to set a pretext for the establishment of "safe havens" and "humanitarian corridors" intended to circumvent the UN Security Council which has seen attempts to green-light military intervention vetoed multiple times by Russia and China. That the UN has failed utterly to condemn the combined provocations and meddling in Syria's affairs illustrates the absolute failure of supranational, let alone, global governance.